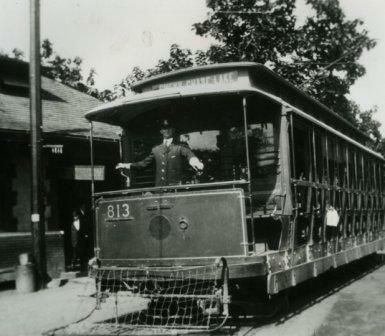 Streetcar #813, used only on the Chevy Chase Lake run between 1909 and 1935, built in 1909 by the Cincinnati Car Co. Donated by Edith Claude Jarvis. CCHS 2008.144.06. Trolley parks, an early form of amusement park built at the end of a streetcar line, were linked with the development of streetcar suburbs at the turn of the twentieth century. The trolley parks served as an attraction at “the end of the line,” bringing potential buyers of house lots to a new suburban development, and at the same time, building ridership on the streetcar line in the evenings and on the weekends. By 1919, there were between 1500 and 2000 pleasure parks of various sorts across the United States. Chevy Chase Lake Amusement Park is an excellent example of an early 20th century trolley park. Opened to the public in 1894, it was operated by the Chevy Chase Land Company, the developer of the new planned suburb of Chevy Chase, Maryland. The streetcar line ran along Connecticut Avenue, from 7th Street in the District of Columbia, up the newly constructed Connecticut Avenue to the Maryland state line, around Chevy Chase Circle, and then north to its terminus, which was named Chevy Chase Lake after the man-made lake created to provide water for the trolley line’s electric generating plant. In 1890, Francis G. Newlands founded the Chevy Chase Land Company and began to acquire land northwest of the newly created Rock Creek Park for a new exclusive suburban development. This planned residential community, to be built in what was still a rural farm landscape, was not easily accessible from downtown Washington, DC. To address this, Newlands and the Land Company purchased controlling shares in the Rock Creek Railway that would eventually run along newly extended Connecticut Avenue, past the recently opened National Zoo. Both the streetcar line and Rock Creek Park added to the value of the property that the Chevy Chase Land Company would acquire for its new suburban development. Congressman Francis G. Newlands of Nevada, early 1890s. Donated by Edith Claude Jarvis. CCHS 1988.05.05. Agents for the Land Company bought more than 1,700 acres of land along the route that they planned for Connecticut Avenue and the Rock Creek Railway. 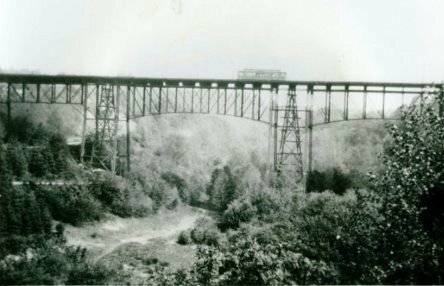 Construction of the new road, railway, and the bridges crossing Rock Creek at Calvert Street and the Klingle Valley was an immense and expensive infrastructure project. 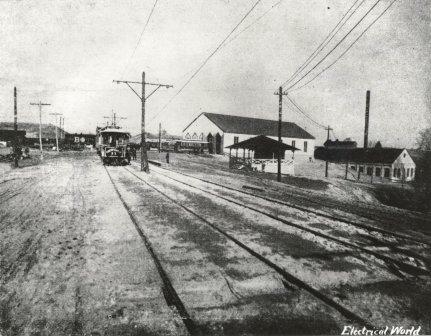 On September 18, 1892, the first streetcars traveled from 7th Street to the end of the line at Chevy Chase Lake, just south of the B & O Railroad spur that ran towards Georgetown. Photograph of the Calvert Street Bridge over Rock Creek, about 1912. Robert Truax collection. CCHS 2008.143.08. The YouTube video animation below shows the property purchased along the projected extension of Connecticut Avenue. At Chevy Chase Circle, on the Maryland/District line, Connecticut Avenue shifts due north. 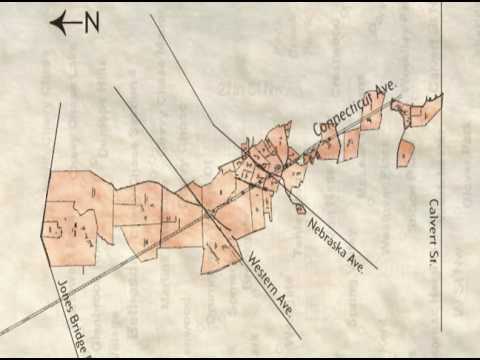 The original plan was to have Connecticut meet Wisconsin Avenue, and the land was available, but was priced too high. A car barn for the trolleys and a power plant were located just to the east of the trolley “turn around” at the end of the line. Next to these two large structures, a small reservoir that would become known as Chevy Chase Lake had been created by damming Coquelin Run. On the west side of Connecticut, a row of small two-family cottages provided housing for the Rock Creek Railway motormen. Civil Engineer Herbert Claude had his office at the depot, located across from the car barn. 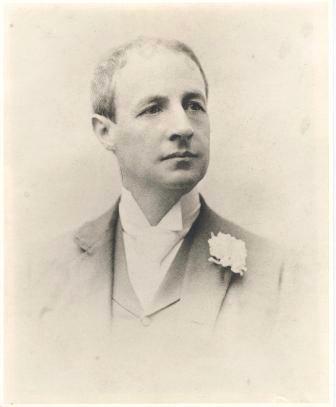 A long-time employee of the Chevy Chase Land Company, he was Superintendent of the Railway, and later ran the Chevy Chase Lake amusement park. Rock Creek Railway's "Country Terminus," at Chevy Chase Lake, with the car barn and power plant on the right, and the B & O Railroad car crossing in the background. From Electrical World, Vol. XXI, No. 2, 1-14-1893, p. 24. Photograph from LeRoy O. King, Jr. Waiting Room and Office, Rock Creek Railway, Chevy Chase Lake, designed by Lindley Johnson. Photo from a 1914 report, Capital Traction Company. From a slide donated by Robert Truax. CCHS 2008.144.05. On the next page, learn about how Chevy Chase Lake was created.